If you are an Airtel Broadband customer looking to check your Internet usage? Look no further, here are some straightforward ways to finding the Airtel broadband data usage for your account quickly. First and foremost, you can check your Airtel broadband data usage using Smartbytes. This is a new service introduced by Airtel; it allows broadband users to buy additional data packages and also Retain High-Speed Bandwidth after crossing FUP limit as well as acting as your internet usage manager. Login into your account on Airtel.in and click on the relevant DSL account. Click on the ‘Manage Services’ tab on the DSL account homepage. Click on activate Smartbyte, to choose the Smartbyte as per your requirements. Also, for you to view Airtel Internet data usage using Smartbytes, you need to visit www.airtel.in from your Airtel broadband connection. The webpage will unveil the internet usage details of your account for the current bill cycle without requiring any login or registration. After this, the page will list vital details such as your DSL ID (phone no. ), remaining high-speed data (non-FUP), monthly high-speed data limit as per your plan (including Top-up and my Home data), and the number of days left on your current billing cycle (calculated month wise). Also, Smartbytes enables you to retain high data speeds by opting for one of the listed add-on data packs. Therefore, in case, your high-speed data limit is exhausted, and you like to change your browsing bandwidth, i.e., 256Kbps, 512Kbps or 1Mbps depending on your plan. Note, related charges for the add-on data are added to your billing cycle. Besides, you can as well check data usage of other Airtel users if you’ve access to their network. Alternatively, Airtel broadband users can as well view their monthly data usage from the Airtel Self-care portal, register your account to manage it and see its detailed information. To view current data using the self-care portal, select your account from the Accounts tab on the sidebar, then click on “History details” to see your daily usage and flutter over to the graph and check the time interval along with the amount of downloaded and uploaded data. Optionally, users can export the details in an Excel file format. 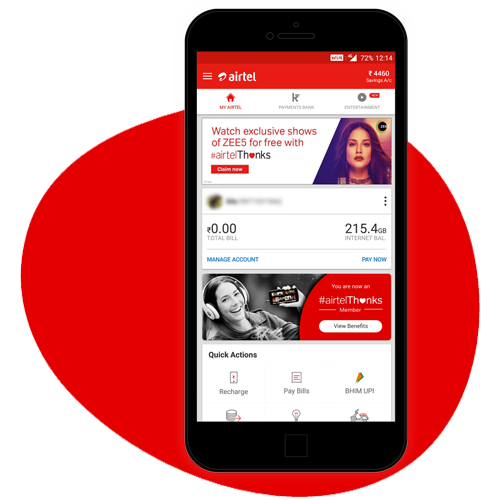 For mobile subscribers – Airtel users can also track their broadband data usage right from their Android or iOS device. All you have to do is to, install the “My Airtel” APP from either the Google Play store or App Store. After downloading, open the APP, select the desired account from My Accounts section. And then select “Data Balance” to view the remaining data. “Home broadband” usage is another smart Android application with a minimal interface, that enables you to check your data usage without you needing to log into your Airtel account.